Hi guys! Since we are at the beginning of a fresh new year, I thought this would be the perfect time to set some resolutions! Now, I’m not talking about life resolutions. Sure, they are always there. Live more healthily, learn a new language, conquer a fear,… But any day to start reaching those kind of goals is a good day. No, I’m talking about bookish resolutions. Hey, this is a book blog after all! Let’s start this off with my yearly Goodreads challenge, shall we? In 2016 my goal was to read 70 books and I ended up reading 81. In 2017 I will try to read 75 books. I want to read a lot of books, but I don’t want this to be something I stress about either. I’d rather read fewer books, but books I really love, than a ton of books I’m rushing through and not enjoying a bit. Of course my backlist is waaay longer than just these 15 books. But again, no pressure! Let’s start with these 15 and see how we do. As you can see from my backlist, I have some catching up to do on Rick Riordan books. The reason I keep procrastinating is because I want to start this by re-reading the entire Percy Jackson and the Olympians series first. Because it’s been almost ten years… But re-reading an entire series takes time, so I keep procrastinating. No more! I figure I can at least re-read one book a month and then I can start The Heroes of Olympus series somewhere mid this year. Totally possible! The truth is I hardly ever pick up a book on a whim. Actually, the last book I picked up on a whim turned out to be a One Direction fanfic with terrible reviews (After by Anna Todd). Now, I A) have nothing against One Direction and B) I haven’t read it yet, so I can’t judge and I’m still going to give it a chance and read it with an open mind, but I’m just saying… I don’t have a great track record when it comes to picking up books on a whim. Almost every book I pick up is because I read great reviews or recommendations by fellow bloggers. And that’s ok, except I think I miss out on a lot of underrated gems that way. So in 2017 I’ll try to pick up a book on a whim every once in a while. Say, 4-5 books at least? In 2017, I’m gonna try to switch it up a bit more! Read some more mystery, historical fiction, non-fiction or horror. Any other genre basically. And maybe I can get my super valid percentages up to 60% fantasy, 20% contemporary and 20% other genres. Or you know, something like that. Because it is super important to read and promote diverse books and #OwnVoices, I want to make more of a conscious effort of picking up diverse books. Starting with the DA Readathon (hosted by Read at Midnight) in January, but of course running thoughout the rest of the year (and life) as well. I still love Top Ten Tuesday and will continue to do so. I’m not sure what I’ll do about Waiting on Wednesday – maybe some monthly “waiting on” posts would be better? I haven’t decided yet. But either way, I still want to have more original content up. I guess I first have to figure out the schedule thing, but I promise to work on this in 2017. What are your bookish goals and resolutions for 2017? Awesome resolutions 🙂 I also need to read out of my comfort zone once in a while, and I would also like to write more original content for my blog. Hope you achieve all those resolutions! Have a lovely rest of the week. Those are great resolutions/goals!! I so need to read more books I already own and more on a whim. Good luck with all of these! Great goals, Lindsey! So many of these are ones I want to accomplish too like beating my backlist. My TBR is insane, haha. I’m totally on board for you catching up on Rick Rirodan books 😀 They’re all so amazing!! Thanks, Lauren! Haha, I know, those TBRs only seem to get worse 🙂 I’m so looking forward to catching up with all Rick Riordan books! These are great goals! I have a post coming up next week on my blogging goals for the year, and I have some similar ones to yours! As far as reading, I’m also going to try to read more of my backlist this year. Thanks! Looking forward to reading about your goals 🙂 Hope we’ll both have an amazing reading year! Thanks! Haha, I know, those TBR’s are crazy 😉 Hope we’ll both have an amazing reading year! Those are some great goals. Making a schedule is totally helpful. I have a planner where I plan mine out. It’s def lowered my stress. Good Luck with your goals! I definitely plan to work on actively reading outside of my comfort zone this year and hopefully that slides into reading books with more diversity / diverse authors. Great resolutions, I hope you reach your goals 🙂 I agree about reading about of the comfort zone, you can find out about so many break books that way. Great list of goals. I’m working on my post for blogging/reading goals right now and see that we share some similar ones, especially working on those huge TBR and writing more original content. These are FABULOUS resolutions! I had the same issue with Waiting on Wednesday, and ended up dropping it. I planned to do it like, once a month and just do a big one, but I didn’t miss it so… I didn’t 😉 I still do TTT, but only if the mood strikes me hahah. I need to get to my backlist books too, so very badly! When I did The Indecision Games, I hadn’t realized it, but it is a great way for me to read backlist books! I have already read 4 or 5 of the 13, so yay! And I totally agree with you about not making things stressful- I put wayyy too much stress on myself, and am trying super hard to not do that this year! Good luck, I am sure you will do amazing! Lots of great goals, Lindsey – best of luck with them all! I would like to write more original content too. I’m still going to participate in memes like Top 10 Tuesday because it’s a fabulous way to meet new people, plus it’s one of the blog’s more popular views, but writing more articles has been something I’ve wanted to do for a long time now. Also, this > “This bookish community is one of the best things about blogging ” SO true. Hope you can enjoy more “whim” reads too! I don’t as much just because I’m kept too busy with review books, which I totally realize is my own fault. Thanks! Yes, Top Ten Tuesday is so much fun and I don’t want to give it up yet either! It’s my favorite type of posts to write and As you said it’s one of the best ways to get to know new bloggers. Hope you’ll have some more luck with “whim” reads this year and that you’ll just have an amazing reading year! My GR challenge this year is 100. I’m already behind. ? But I figure it’s just a number and I’ll either get close, or I won’t! It’s a big goal for me so I might not make it. My biggest reading goal is to read more indie books. One a month on average is my current goal. I’m also participating in a couple of challenges / read a thons this year which is fun and I’ve started the Fantastically Diverse readathon by Uma at Books.Bags.Burgers so a little diverse reading is happening here too! My back listed TBR…. Well, probably better I don’t speak of this monster but I do want to try and go through it and cull out whatever I can’t see myself reading anymore. As a blogger I want to try and visit all my current blogger pals but I also want to make the effort to visit new blogs and especially smaller blogs and if they interest me I’ll leave a comment and see if I can’t make some more bookish friends. I’m not too worried about posting more or less or as per a schedule but I do want to remain with my current feature memes and get at least one review up per week. Whew! So there you have it! 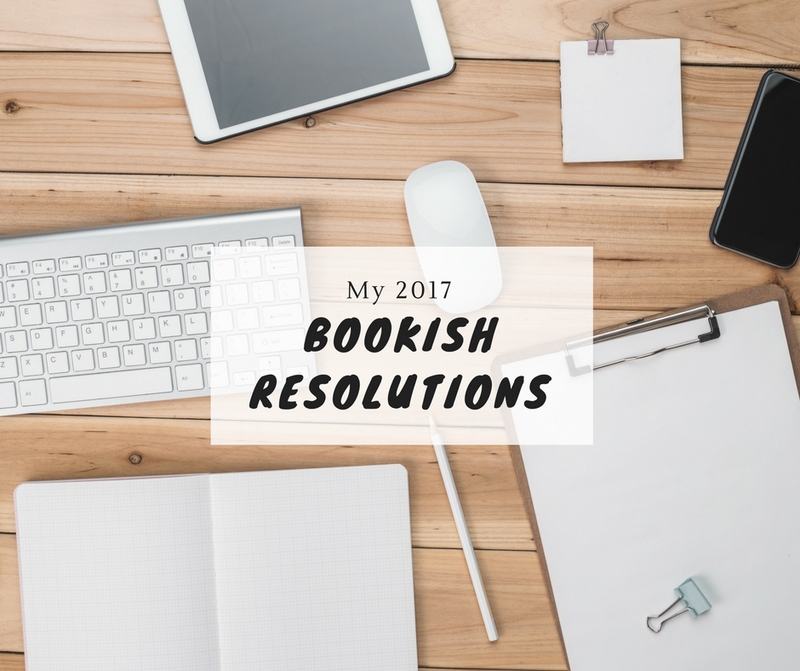 My 2017 bookish resolutions! Oh, those are some great goals too! I like the idea of reading more indie books and making more bookish friends. Good luck with all these resolutions!